"The Good and The Evil" in a limited edition (1.000 copies) pressed by Icewarrior Records. The cd "The Good and the Evil", with personal sticker on back cover (with name of buyer and number of cd), 2 stickers, 2 guitar picks, a letter. HERE you can read more and you can ORDER your copy. 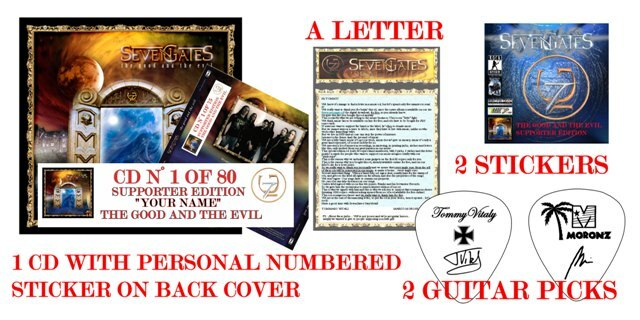 The 2nd SevenGates's cd “The good and The Evil” finally available! The cd, recorded at the Zenith Studio Recordings, is available for FULLY FREE DOWNLOAD in mp3 format. Booklet and full artwork are included too, FOR FREE. Check it out in the download section. This was possible due the band will to do a real gift to all the fans asking us about the new cd release during the last 3 years. The band would like to thank Mr.Frank Andiver who kindly and freely has given us the permit to upload our new songs on this website. We're leaving the promotion of "The Good and The Evil" to work on our future cd, "Betrayer". Tracks are ready, we're still waiting vocals from Eugent (we already have the first 3 tracks), hopin' to mix them asap. After a lot of work in promotion, we have to say a GREAT "THANK YOU! ", to all people supporting us. We're still workin' on some supporter's stuff... stay tuned!